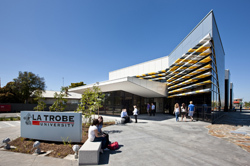 On Monday 6 December 2010 La Trobe’s opened its new $10.9 million dollar Shepparton campus. Designed to improve the University’s engagement with communities, the campus also aims to substantially increase participation in higher education in regional Victoria. The architects were inspired in their design by the colours of the region, indigenous art, the feel of cool water and the wooden fruit boxes typical of this fruit growing area. The 2000 square metre, two storey building includes deciduous trees along North Street that will provide shading in the summer. The internal design facilitates contemporary approaches to learning and teaching using flexible teaching spaces, and the ground floor includes a café/bookshop that becomes part of the study space providing and an open plan area for students, staff and the community. The first floor is a mix of staff offices, break out areas, meeting rooms and desks for visiting and research staff. There is also a state-of-the-art Clinical Learning Unit for nursing and allied health students. It has been built with future expansion in mind. The building was designed to meet Environmental Design standards including on-site recycling of rain water, solar hot water, high efficiency light and water fittings, renewable materials, and cyclist facilities.